The Ochils Festival is a varied programme of FREE events throughout June, designed to celebrate the landscape, heritage and people of the Ochils and Hillfoots area of Clackmannanshire and Stirling. The programme includes something for everyone - locals and visitors alike: walks; talks; workshops; craft, discovery and genealogy sessions; tours of historic kirkyards; and fun family activities. 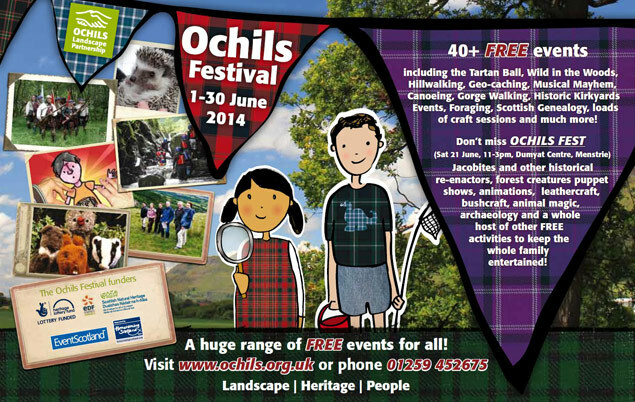 There is an unmissable family day on Saturday 21 June - Ochils Fest. New to the programme for 2014 is the Tartan Ball, a revival of the event that was first held in the 1840s to give the local textile industry a boost. Each June the Ochils Landscape Partnership hosts the Ochils Festival, a varied programme of events designed to celebrate the landscape, heritage and people of the Ochils and Hillfoots. Each event helps to encourage a greater understanding and appreciation of this unique area. June 2014 promises to be AWESOME, with an extensive programme of 40+ FREE events. An authentic 17th century campaign camp where you can learn about food, clothes, weapons and even make-up! Tree Cookies - make and decorate your very own necklace from a tree branch! To see more photos from Festival events, visit our Facebook page. If you want to see what we got up to last year, you can download the Ochils Festival 2013 brochure from our downloads page too!